Bushnell Compact Falcon™ 7x21 Binocular has a full 340' field of view.Promotional Bushnell Compact Falcon™ 7x21 Binocular. 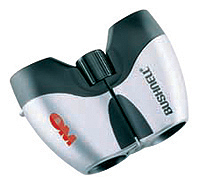 Bushnell's Ultra-Light (4.7 oz) Compact Binocular is feature packed and affordably priced. Coated porro prism optics, 7 x 21 magnification and Bushnell's patented insta-Focus center focusing system, all in a sleek contemporary design. Carrying case and wrist strap included.